A week and a half ago I met a remarkable woman whose work brought me to tears and who gave me a sense of hope in the kindness of others. Shura Wallin, the founder of Green Valley Samaritans in Sahuarita, AZ, spoke to a small group of like-minded participants of a seminar discussion at the Circle Pines 75th Anniversary Celebration in Southwest Michigan. A tiny woman with a huge heart, a big message, and a spitfire to boot, shared with us her stories of locating migrants who are found suffering and offering them first aid, food, and water to prevent them from dying in the desert as they cross the border and make their way toward Tucson. Her stories were touching and she reminded me just how closely tied we are to others and how we can always find a common thread of understanding to carry us past differences of personality, religion, politics, and all other ‘issues’ that can stand in the way of finding common ground. If we try, we can usually find a common thread despite our differences. One of the reasons I love food and cooking so much is that it offers a common ground and shared experience. Drop the politics and a group of people coming together over good food can come to coexist over the shared joy of food. It is also the finest way I know to show someone you care for them. For me, cooking healthy but tasty foods and sharing them with those I love is the simplest gesture of love I can offer. I love having friends over to share a meal with us. I love sending them home, bellies full and leftovers in hand to enjoy for lunch the next day. To me, food is love. Not too long ago (but long enough ago to make me feel like I’m behind on posting!) I whipped up these spring rolls when our friend, Natalia, had a canceled flight and ended up staying the night with us. Although I’m sure she wasn’t thrilled about the canceled flight, I was overjoyed at the opportunity to have her for dinner. It was a hot and sticky night that called for something fresh and cooling. We had a wonderful night hanging out and I loved hearing Natalia and Drew share their new songs with each other. I felt lucky to share an unexpected meal with a very cool new friend. This recipe is great because it satisfies those who eat gluten-free, vegans (without the sauce or with a modified sauce), and vegetarians, as well as meat eaters and picky eaters. The fresh spring rolls seem to be a universally enjoyed dish, at least amongst the many friends I’ve served them to. 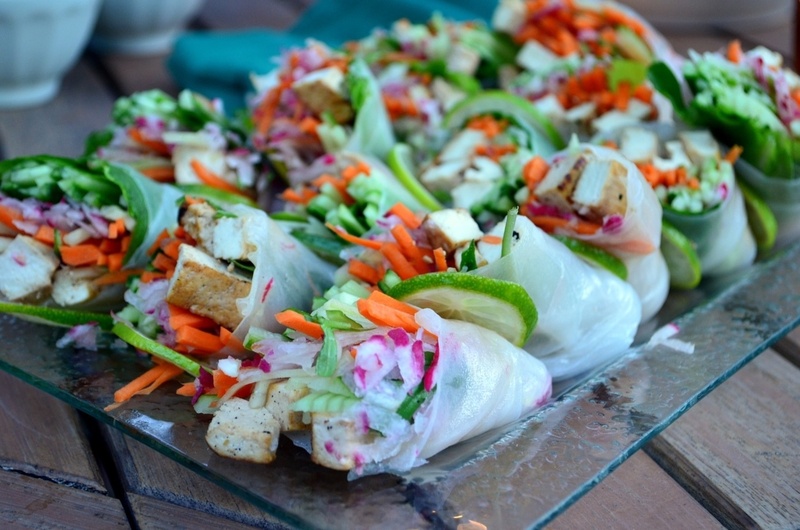 Fresh spring rolls can be concocted in a myriad of ways–this is just the way I do it most of the time. Feel free to experiment or pick and choose various components from other recipes. Here are a couple of others to pick and choose from: Fresh Spring Rolls from Cooking Light (2004), Fresh Vegetable Rolls from Cooking Light (1999). Add oil to a wok or skillet and heat until very hot. Toss tofu into pan–you’ll need to keep an eye on it to avoid burning and toss with a spatula or spoon until browned. Turn off the heat and dash the soy sauce onto the pan. Toss tofu into sauce and let sit to cool for a bit before making the rolls. To prepare dipping sauce, combine all six ingredients. Stir until sugar dissolves. Let sit while making spring rolls. To make the spring rolls, put an inch or two of hot water in a wide, shallow dish with sides. I sometimes clean out the sink and fill it with water if I can’t find a bowl right away. Place one rice paper sheet at a time into the water. Let soften–it will take about 30 seconds. Don’t soften too much or the sheet will fall apart–you’ll get the hang of it after a couple of tries. Put rice paper sheet on clean counter or a large plate. 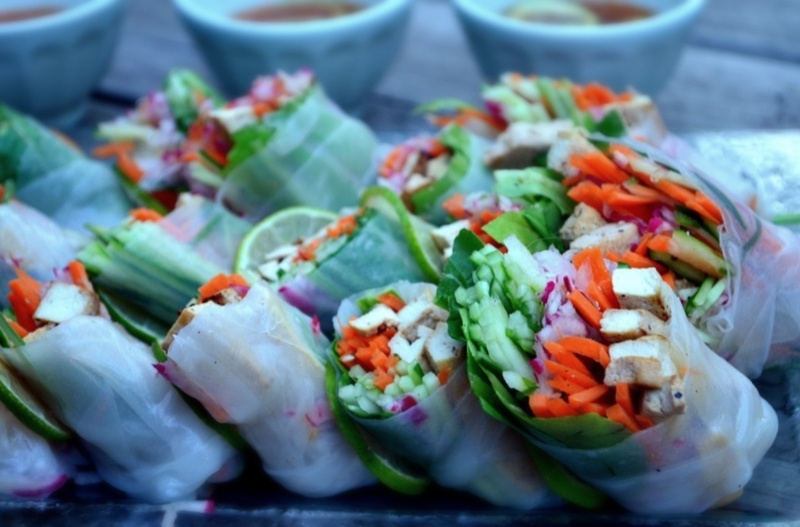 Put one piece of lettuce in the center of the sheet and top with carrots, cucumber, radishes, tofu, and some chopped herbs. Fold one edge over the filling, then both sides, rolling as you go. The rice paper will stick and form a seal. Press the seam if it doesn’t automatically stick. 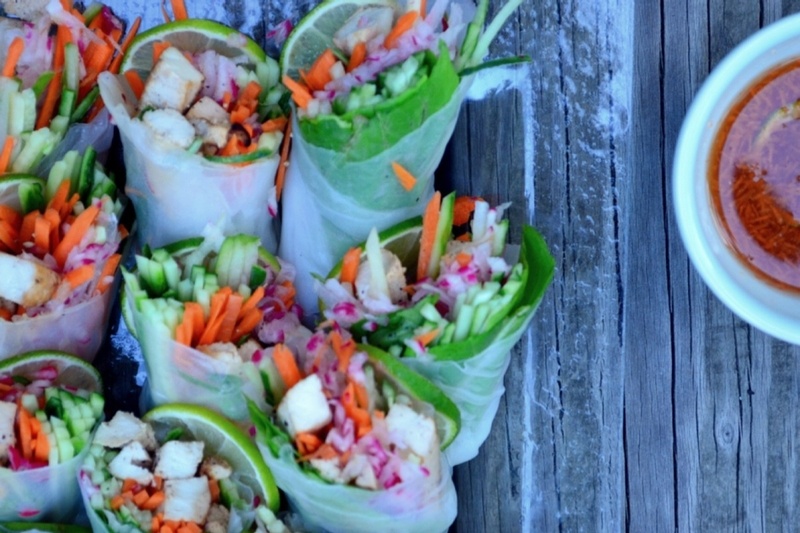 Put the spring roll on a platter, covering with a wet paper towel to keep from sticking. Repeat with remaining ingredients until you are out of either filling or papers. Slice on a diagonal, arrange on a beautiful platter, and serve with dipping sauce. I am excited to make these spring rolls and just bought the ingredients listed but am now confused- I purchased Sambal Oelek and it is described as “ground fresh chili paste” on the label. There is no garlic in it. There is something else called Garlic Chili Sauce, so I’m wondering if that is the ingredient to use. Will you please clarify, Aura? Thank you! Sorry I didn’t get back to you sooner, Patty! I was on vacation. I made the mistake of referring to my chili-garlic paste as Sambal Oelek. But not to worry–the chili paste you got was the same as what I used, just no garlic. Feel free to use either!